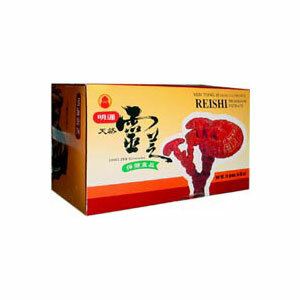 Reishi is traditionally considered the world’s most precious food and was once available only to emperors and royalty. Each pack is equal to the essence of 6 grams of dried Reishi Mushroom. Our Reishi extract retains the pure, authentic taste of the original mushroom. Min Tong Reishi (Ling Zhi, Ganoderma lucidum) granule extract is made from only the finest variety of mature red Reishi mushroom, organically grown in China and concentrated through water extraction. Reishi is traditionally considered the world’s most precious food and was once available only to emperors and royalty. Each pack is equal to the essence of 6 grams of dried Reishi Mushroom. Our Reishi extract retains the pure, authentic taste of the original mushroom. Dissolve one pack of Reishi extract into one cup of water, sweeten with honey or juice if desired, drink once or twice daily.